St. Louis Style Pizza Recipe - no yeast pizza dough! Cracker crisp crust and an amazing cheese blend make this my favorite weeknight pizza! St. Louis Style Pizza - no yeast pizza dough! Cracker crisp crust and an amazing cheese blend make this my favorite weeknight pizza! Ready to bake in minutes! Flour, salt, baking powder, olive oil, corn syrup, water topped with a cheese blend of white cheddar, swiss, provolone and liquid smoke. Top with your favorite toppings. This pizza is THE BEST!! I am always on the hunt for pizza perfection. For me, this recipe might be it. This was the first time that I tried St. Louis Style Pizza, and it was fabulous! We both love thin crust pizza and this pizza is cracker thin. What makes St. Louis style pizza unique is the cheese. It uses Provel cheese instead of mozzarella. Provel isn't common in Alabama, so I used a facsimile of white cheddar, swiss, provolone and liquid smoke. I was hesitant to try it, but I am so glad I did. It was SO, SO good!! It really makes the pizza. I've made this pizza numerous times in the last few weeks. We just can't get enough of it! It is our favorite pizza - anywhere. Place pizza stone in oven and preheat to 450ºF. For the crust: Mix ingredients until thoroughly combined. Shape it into a ball and roll it out paper thin on a piece of parchment paper. Top crust with pizza sauce. Toss the shredded cheese with liquid smoke. Sprinkle on pizza. Top with favorite toppings. Sprinkle with Italian seasoning. Transfer pizza on the parchment paper to pizza stone. (I use a cookie sheet to move it). Bake 12-15 minutes, until cheese is golden and crust is brown. Allow to cool 3-5 minutes and slice into squares and serve. This looks so good! What kind of pizza sauce do you like? I can never find any that tastes like a restaurant sauce. As a St. Louisan I'm very happy to see St. Louis style pizza being enjoyed in other places! I work for a local grocery store chain and we often have people buying Provel in 5lb blocks to ship back home. Let me know if you would like some! I'm curious, where in St. Louis did you try your pizza? I live in St. Louis and there are some good and not so good versions of this pizza. I have never used the liquid smoke for anything but BBQ. Interesting twist....what if you dont have a pizza stone? same temp on pan? that looks sooooo delicious! pinning! This looks fantastic and made me instantly hungry. Definitely a cheese loves pizza. we live in St. Louis and STL style pizza is always a great debate...people either love it or hate it! I don't mind it, esp the cracker thin crust! Yours looks spot on! I like the thin crust, I prefer it that way. Plus it cooks quicker. Wow! Your pizza looks terrific! What brand of pizza sauce do you prefer? I find that is the one thing that I have the most trouble reproducing when I make pizza at home. Yay for St. Louis pizza love! I admit that being in St. Louis I'm totally spoiled, but it really is an amazing pizza, isn't it?! And, serve it with Toasted Ravioli and follow up with some Gooey Butter cake and you'll have St. Louis ready meal!! So not a fan of Provel cheese. But I do adore cracker thin pizza crusts!! Now I am craving one of our local thin pizza crust pizza places!! When you go out of town and hit up your Trader Joe's, buy a package of their Lavosh Flatbread (large flat rectangles in the bread section). These make PERFECT thin crust pizzas. They are already somewhat brown and bubbly, but I toast them again when I heat the pizza and it goes very quickly. The edges get brown and crackly and although it's very thin, it holds up extremely well to toppings provided it isn't a deathload of them. I just spread a little bit of sauce thinly and all my standard toppings, and broil it in my Pizza Pizzazz Oven (that broiler is so dang handy, really) and it's the perfect thin-crust for me. Easy to divide as well, since it's a rectangle. So no yeast at all in the crust?? okay, thanks! I'm giving this crust a shot tonight, I hope it turns out like your photo... looks delish! Success! Great recipe! I was initially a little doubtful at a yeastless crust, but it was really, really good. I doubled the recipe for 2 pizzas, and my only variation was that I preheated my pizza pans in the oven in lieu of a stone. I'm so thrilled I've finally found a homemade crust that is crisp and thin, thank you for sharing. I'm so glad to hear the pizza was successful! 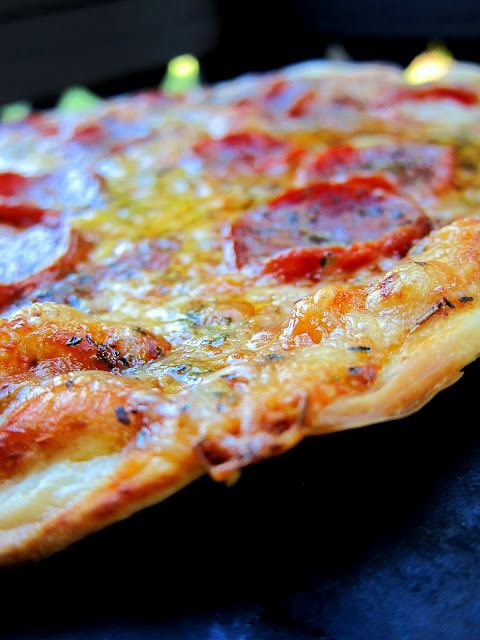 This is our favorite pizza - we love the crust too! I grew up in St. Louis and this is about as close as you can get. Great recipe and super easy. My husband loved the crust and I liked the fact that you don't have to proof the dough. It took a bit to get the hang of working with the dough because it's a little looser and stickier than average pizza dough. I used lots of flour on a wooden board and pressed it out by hand instead of rolling it. Works great in a regular pan if you don't have a pizza stone too. I tried this last night, and honestly didn't expect great results, but it was sooo good! It wasn't quite as crispy as my favorite Pizza Inn thin crust, but it reminded me of that flavor. Next time I'll roll it out even thinner. This is a keeper, especially if you like thin crust pizza. I just topped mine with some sauce, mozzarella and parmesan - yummy! Oh my gosh, I am a St. Louis girl. Problem is I know longer live there and that is the only place you can get Provel, which is the "cheese" they use on St. Louis Pizzas. Yours looks like the real thing. We will have to give it a try!!!! G'day! I saw your photo and it jumped out at me too! I was wondering re toppings re St Louis pizza...is there a traditional old world topping and a new world one too? Or is the toppings personal taste? Thank you! I would love to make this pizza sometime soon too! You Bale it on the parchment paper? I do bake it on the parchment paper. What kind of pepperonis do you use?? I moved from Suburb of Detroit, MI to N. Atlanta area and have not found pizzas that I like...the pepperonis seem so cheap and fake...so I have decided to make my own pizzas at home...funny thing is I was a pizza cook in a restaurant when I was 16-21 yrs old...way back when so I know about good ingredients..now I just have to find them, lol...thanks for your help!! I think you can leave out the liquid smoke if you found Provel cheese. My husband and I love St. Louis style pizza. I am going to make this tomorrow night. Can I prepare the crust a couple of hours ahead and refrigerate until I am ready to use it? I've never tried making it early. It only takes a minute to mix together. Thanks Stephanie. My husband and I live in kansas city and grew up on St. Loius style pizza. I made this last night and it was amazing. We have provel cheese in our stores so it was very easy. This will definitely make it into our routine. A St. Louis style pizza sure sounds really good to have. I'm thinking about maybe making one for my family just to see if they'll like it. Well, they like all type of pizza flavors so hopefully they'll approve of this flavor. I've made this twice this week for my family because they just LOVE it! Thank you so much for such an easy recipe w/fantastic results! BTW, I've just used a blend of parmesan & whole milk mozzarella.